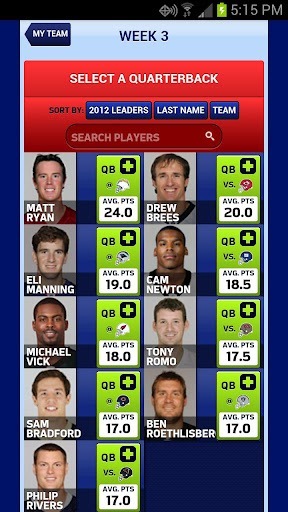 Your team will earn points based on the real-world achievements of your digital avatars. There are no "games" per se - your point totals are ranked against a worldwide leaderboard. 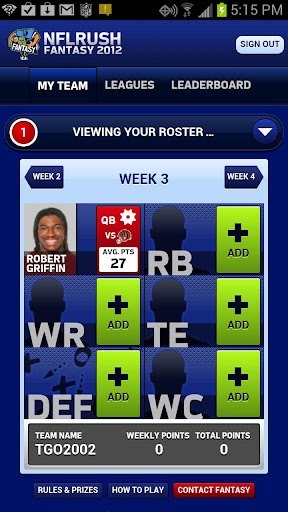 After the first week you can keep your current players (you've got dibs on anyone currently in your line-up) or swap out individuals, up to and including the entire team. Oh, and you only get six players: quarterback, running back, wide receiver, tight end, defense/special teams, and a wild card. I bet all those NFL defensive players and offensive linemen feel like chopped liver. 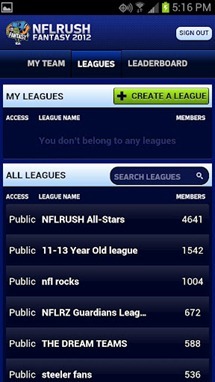 So why play NFLRUSH instead of (or in addition to) your current fantasy league? If you're over the age of 15, there's really no reason to. But for the youngsters out there: prizes, baby. The highest scorer for each week will win a $1000 scholarship and some free NFL swag. The highest-scoring NFLRUSH player over the entire season gets a $10,000 scholarship, and two free tickets to the NFL game nearest their hometown. Parents, remember that it's cheating to play with your kids' names.